This week we are being sponsored by Robyn's Fetish. The DT were given some images to play with. The image I used on my card is called Bella da Snowlady. I backed my card in green cardstock. Then I added a layer of green gingham paper backed in white cardstock. I took a sheet of green paisley color block patterned paper and cut off a piece of the red block and added it to the bottom of the card. I backed my image and sentiment in green cardstock backed in white cardstock. The snowflake is made by punching 2 different sized snowflakes. A large one out of white cardstock and a small one out of the red patterned paper. I added crystal stickles to the white cardstock, snowflakes and to the image. I also added Christmas stickles to the hearts and pocket on the image. I finished it off by adding green gemstones to the snowflake and to the lower right corner. Thanks for joining in with our Celebrate in Style and Bling it Up challenge at OSAAT. Great card. Love the sparkle you added to your snowman. Really makes him pop. Thanks for playing along at Paper Cutz. Lovely Christmas card with the glitter. The image is realy sweet. Thank you for sharing this with us at the ABC Christmas Challenge and good luck. 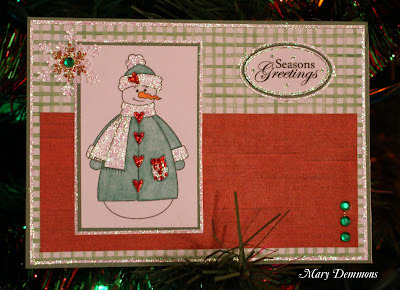 Great Christmas card Mary, sweet image and I love all the glitter on there. Thanks for joining us at OSAAT. Bella da snowlady is such a fun name for a lovely snow lady. Beautiful card. This is a darling card! I love the sparkle you added to the snowman and the snowflake is gorgeous! Thanks for taking on our glitter challenge at Frosted Designs this week! The snowman is pretty cute!! Adorable snowman. Love your card. Thanks for joining us here at Digi Doodle Shops "let it snow " challenge. Love all the sparkling in that card. Lovely sentiment!